Bar Sirocco is positioned in the heart of Annandale village on Booth Street. 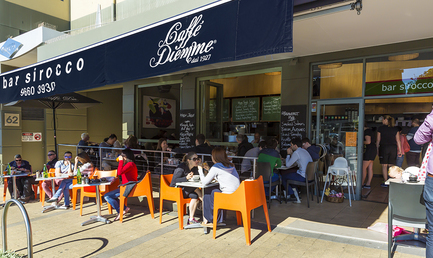 With street front seating on the all weather terrace, we are the prime location to people watch. We are also dog friendly so bring your best mate! The substantial breakfast menu is available all day. Cinnamon French Toast, the classic Eggs Benedict prepared 3 ways or a hearty Sirocco breakfast are just a few of the tasty dishes we have on offer. Our lunch menu is available from 11.30am and features Burgers, Pastas, Salads and Sandwiches, all made to order. If you are in a hurry, grab a delicious house made Blueberry and White Chocolate muffin and a Caffe DM coffee made by our experienced Barista's.